Our expert teaching faculty have research and work experience in the communication field. Strengthen and develop important writing, presentation, and interpersonal communication skills. An emphasis in writing will build a solid core in English grammar and usage, visual communication, editing, and publication design. Coursework includes topical classes like Crisis Communication, Communication Technology Trends, and Corporate Training. The Organizational Communication/Public Relations emphasis focuses on conflict management, group and team dynamics, and leadership. The Communication Studies emphasis area allows students to tailor the major to meet their career goals. The Communication major prepares students to be communication professionals. The program emphasizes communication theory and practice in the creation, presentation, and evaluation of coherent messages. With three areas of emphasis including writing, organizational communication/public relations, or communication studies, the career possibilities are endless. The focus of the major on applied communication skills and successful strategies, immersed in UMC's distinctive technology culture, prepares graduates to effectively communicate within the corporate and public forum and to meet the marketplace realities of contemporary society. 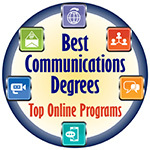 A Communication Minor is also available on-campus and online, and can be added to complement another degree program. Employers seek to hire graduates with strong communication skills. Those who receive a degree in communication from the University of Minnesota Crookston will know how to adapt to changing circumstances and marketplace realities. With this degree, graduates will be eligible for jobs in almost any field. Enter the keyword "communication" at Internet job search sites, such as www.monster.com, www.careerbuilder.com, www.jobbankinfo.org and www.usajobs.gov, to find job titles and descriptions. Kaitlyn Banister, communication major from Marinette, WI gives some great advice for online students. Read her article "Great Advice from Online Student Kaitlyn Banister" in the Spring 2015 issue of the Torch magazine.